Now through April 10, Chelsea Gifts offers a free pasta/soup plate with any Kate Spade 5-pc place setting. That’s a $65 value! When creating a bridal registry, the lists of must haves and wants can quickly take any bride or groom down a very nerve wracking path. It may seem daunting at first but creating a bridal or gift registry can be simple and even fun. Come visit us at Chelsea Gifts and meet Chelsea and the bridal registry specialists that are always available to help you sort through the questions and confusion and assist you in choosing all the right pieces. From dinnerware, glassware, flatware and serving pieces, Chelsea and our specialists help smooth the way to your newly wedded life. We try to guide our couples in the best direction to suit them and one of the best places to start is the Kate Spade Home collection. Classic, chic, elegant… are all words used to describe the Kate Spade style that began a few years ago with those cute little black handbags. That same sense of style has carried over to the Kate Spade Home collection which includes everything from dinnerware, stemware and serving pieces, to fine gifts such as gorgeous picture frames and vases. Whether you’re looking for formal elegance to wow your dinner guests, or something simple and stylish to make every meal special, Chelsea Gifts and the Kate Spade Home collection have pieces to fit the way you live and entertain. Chelsea Gifts helps make questions like these and other bridal quandaries easy for the new couple to navigate. How do you know which pieces to pick or how many to ask for? What’s the difference between a melon spoon and a soup spoon? How do you avoid the trendy but still show your sense of style? Would you rather have formal place settings or something more for everyday? Are you more of a classic white style or do you prefer pops of color and print? Do you normally have quiet family dinners or do you prefer to entertain the masses on a regular basis? How do you choose a set that fits you—one that you’ll still love decades from now? Sound familiar? With help from the bridal guides at Chelsea and Kate Spade Home, you’ll be able to get answers to your questions all while being able to mix and match beautiful pieces to complete your new home together. When planning any event, whether it be wedding, garden party, or even Thanksgiving dinner, in most cases, budget is a factor that needs to be considered. With that in mind, when you find a special on something you love, it’s always reason to celebrate. So, go ahead, you can start the party. 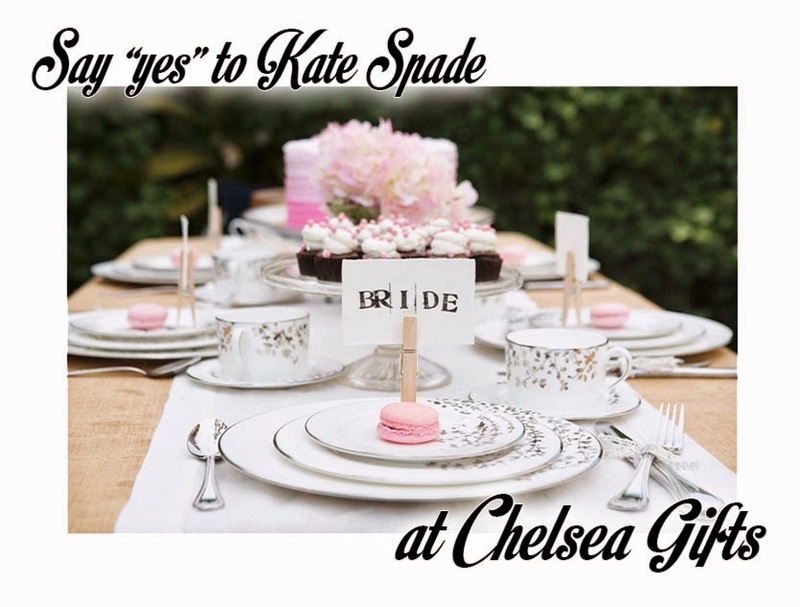 Now through April 10, Chelsea Gifts is offering a free pasta/soup plate with any Kate Spade 5-pc place setting. That’s a $65 value! With Easter and Passover quickly approaching, now’s the time to stock up and be ready for all those extra guests. We even have free shipping on most orders over $99. With all the different decisions and choices new brides and grooms have to make, it can be easy to get “lost down the rabbit hole”. Come see us at Chelsea Gifts and let us help give you your “Happily Ever After”. We’re in The Grove at Shrewsbury or you can visit us online at https://www.chelseagiftsonline.com and let us help guide you and build your Kate Spade Home-filled future!